My first big event of the year after a couple of warm ups at the Thames Trot and St Peters Way Ultra and I was looking for an improvement upon 2012’s fancy dress effort where I finished in 23.30. The slightly unrealistic “dream” goal was somewhere near 20 hours with a more realistic target of 22 hours. I had the Spartathlon cut off times in the back of mind and wanted to try and get under these times to demonstrate some improvement on last year’s effort. Unfortunately my “curse of the weather conditions” was still continuing from 2012 which had resulted in an amended route due to flooding from the planned Richmond to Oxford route to an out and back route from Richmond to Cookham and back to Walton on Thames then back to Cookham before finally turning back to Windsor for the finish. This was going to add about an extra 3 bonus miles to the trip making it about 103 miles in total, so I added about 30 mins to my goals making it a 20.30 – 22.30 range. The only little issue I had was a slight groin strain from the Thames Trot where I had slipped and over extended my leg straining my groin. This hadn’t stopped me running at all but it was a little niggle you could feel from time to time (i.e. when you twisted over in bed or coughed violently). I travelled up with fellow runner Michael Sartorius and Dennis Cartwright who was sweeping. It was snowing and sleeting as we travelled which along with freezing temperatures was the predicted weather for the weekend. Not what you really expect in the South of England towards the end of March! It was fair to say Michael wasn’t particularly keen on running the race due to the weather conditions and cold weather and spent the entire trip to the start of the race whining about these conditions. We had planned to run together for the start of the race so I was really looking forward to 20+ more hours of this type of conversation! We arrived at the start at the town hall in Richmond, registered (although I think I accidently cut a queue somewhere as Wendy pointed out she had arrived before me and was still queuing so apologies if I did) and then went through the mandatory kit check saying hello to Claire and Drew on the way. James gave his race briefing and highlighted the weather conditions and potential effects on runners and we made our way outside for the start. Michael and I set of in the middle of the pack but were soon overtaking people. Michael glanced at his watch and commented, “the pace is a little fresh” as we were clocking 7.15m/m at the time… time to slow down. That was the danger when my last proper run was a Half Marathon a week ago. We tried to slow the pace down and got to around 8 – 8.30’s. 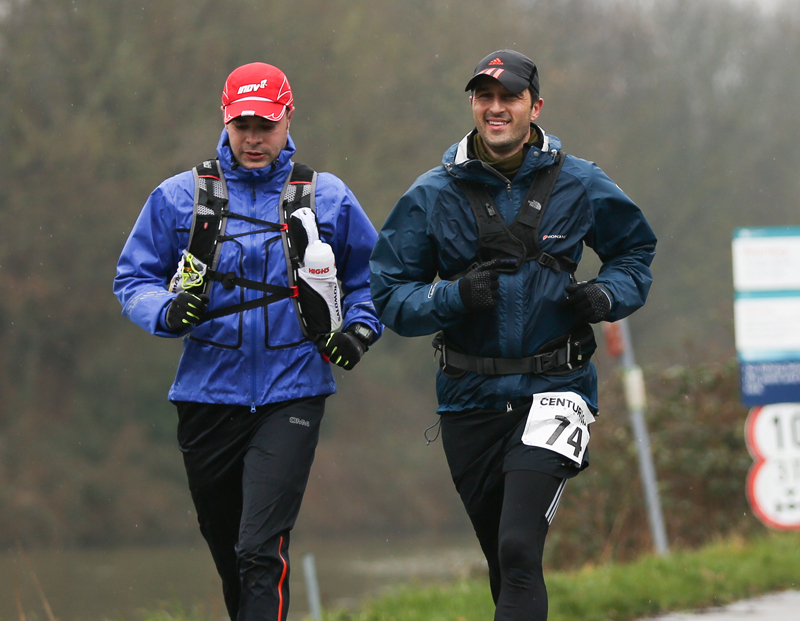 I met for the first time and had a good chat with (Ultra Tales contributor) Richard Ashton at the start who I had missed at the St Peters Way (well he ran at the front and I plodded at the back of that one) as worked our way from Richmond to the first checkpoint at Walton on Thames. I knew the pace was still a little quick when I arrived at Checkpoint 1 to spot Allan Rumbles and Leila Rose and told I was in a top 10 position.. oops. I grabbed some sandwiches and then walked half a mile whilst eating these so I didn’t waste too much time at the checkpoint and rested my legs. It didn’t take long for a trail of runners to start passing me. 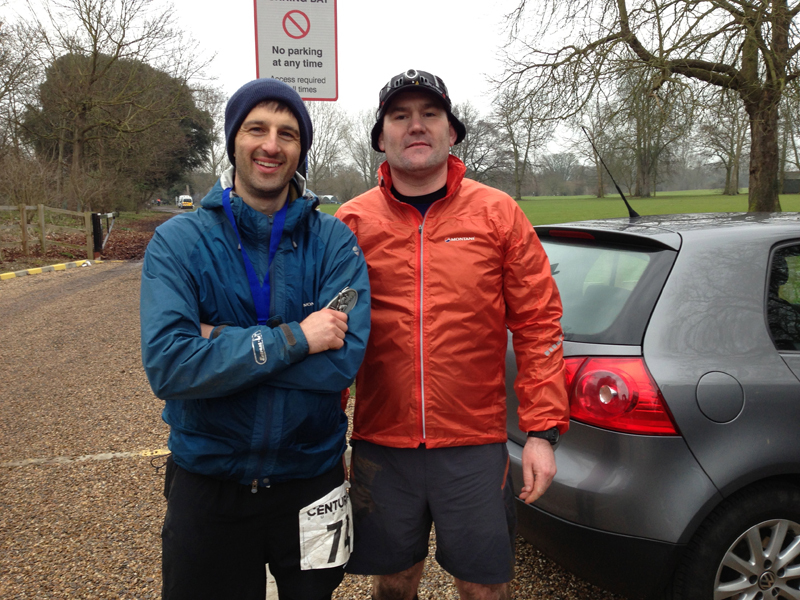 Michael and I continued from Walton on Thames through a suburban area and then onto a muddy trail towards Wraysbury. On this part of the route I tripped on an exposed route went head over heels and landed in a muddy puddle as Dino Ilaria trotted past commenting that my comedy fall would have made a lovely photo for the next issue of Ultra Tales, thanks mate! I had started to drift a little ahead of Michael who was a couple of minutes behind and after a short while I arrived at Wraysbury having covered 22 miles in 3.13 and grabbed some food and marched on for half a mile whilst eating a few sandwiches and wraps as I headed on towards Windsor. I caught up with Mimi a little while after this checkpoint which immediately set alarm bells ringing in my head and was sorry to learn that she was not having a good day and was intending to drop out at the next checkpoint. This next stretch was only about 6 miles and I arrived at Windsor for the first time around 4.12 having covered 28 miles. I didn’t tarry at the checkpoint for long but grabbed some food and walked out and then immediately encountered a slightly flooded area of water, which was about ankle deep. There was no choice but to go through it which meant cold wet feet and I prayed the drymax trail socks would do their job and start to expel the water. I normally have a little slow down around the 20 mile mark but it hit me here as I got closer to 30. After a little stop start run/walk, I eventually dug out my ipod and put on some music to distract me and managed to get a little run going. I was running largely by myself but saw the occasional person on the route as I headed towards the turn point at Cookham. 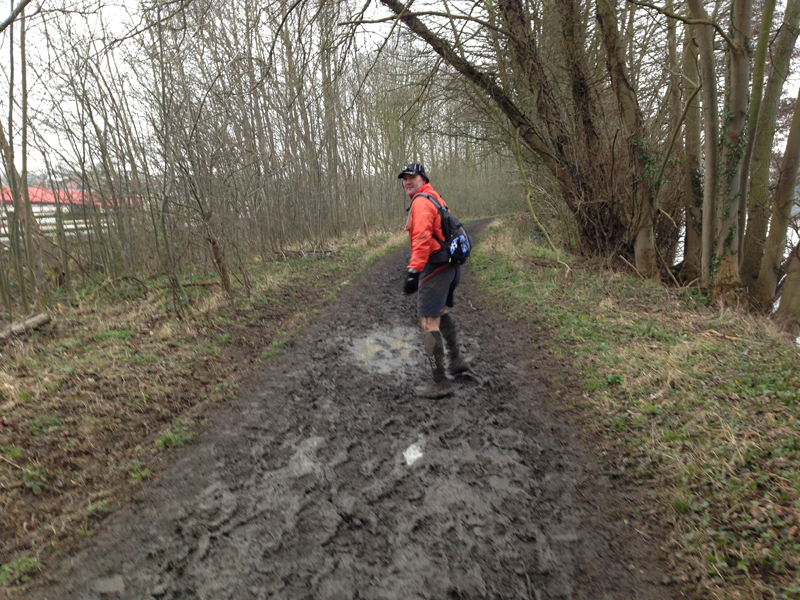 This leg was a mixture of trails, muddy trails and then roads in Cookham. My back was really giving me some pain here and I realised I has been ignoring the fact that my head torch had been digging into my back and so at one point I stopped, emptied my entire kit out and re-packed my bag to make it more comfortable. Unfortunately the damage had been done and I had to suffer a bruised back for the rest of the race. As got within a few miles of the checkpoint, the lead runners were on their return leg and I gave the lead guys and lead lady (Debbie) a wave and a clap in acknowledgement and a couple of high fives to the odd face I recognised. I eventually arrived at the checkpoint in 6.19 having covered 38 miles. Cliff Canavan-King greeted me with some enthusiasm and as I grabbed a hot drink, some snacks and then headed back towards Windsor and the 48 mile point. It was good to start to pass runners on the way back and there was some good camaraderie between runners with a wave, a well done or some acknowledgement being passed between runners. I passed Wendy Shaw and Michael Sartorius who were close behind me and then bumped into Matt Dunn and Sally Ford and stopped and exchanged a few words before heading on. After the initial excitement of seeing runners on the way back for the first few miles the pace slowed as a few run/walk miles were thrown in and the weather started to get a little gloomier as we headed into the evening. 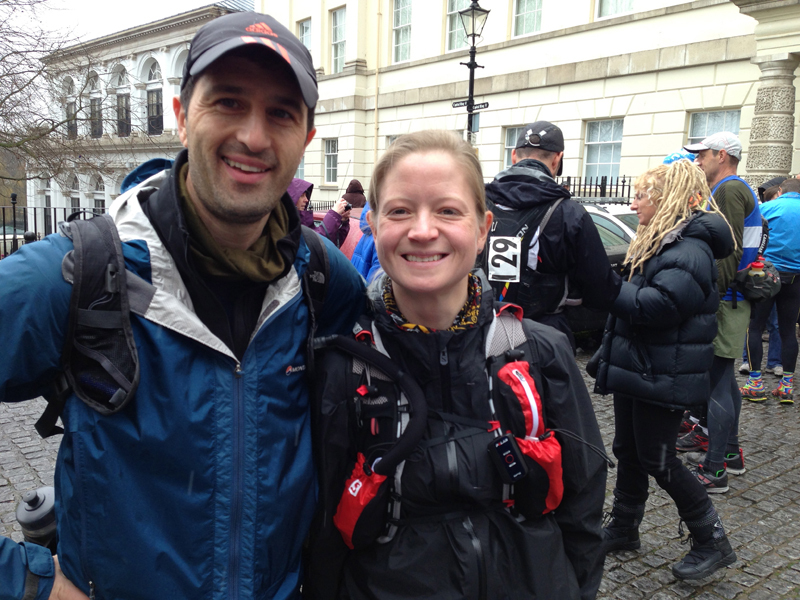 I was due to meet Lindley Chambers at the next checkpoint where he was going to accompany me for the rest of the race and through my usual dodgy sleep walk phase at night. I managed to hang on those last few miles and arrived at the checkpoint where I met Lindley and stopped for some hot food so probably lost about 15 minutes here. Wendy had already arrived at the checkpoint and looked at me quizzically as I arrived but I had taken a minor deviation through the boatyard and missed the left hand turn back onto the path so she had probably passed me there. My feet were soaked again after the Windsor checkpoint puddle but I couldn’t be bothered to change my socks which would have meant more faffing around and headed out of the checkpoint and walked the first half a mile to let my food settle as we headed out towards Wraysbury for the second time. However, I did change my gloves from my sealskinz pair (which kept my hands dry but not that warm) to a thick fleece pair which were a little toasty and I had to remove them from time to time to keep my hands cool. At this point I had covered 48 miles in 8.30, so was just about on dream pace goal at the moment. I was feeling better after some hot food but the continued sleet, wet weather, mud and slippy ground conditions weren’t making this event that enjoyable and there was a long night slog ahead. Lindley and I jogged walked a few miles as we headed towards Wraysbury for the second time through the mud. Lindley had elected to wear his Hoka’s and was slip sliding all over the place (he fell over twice during the night) and we had a good catch up about running and various stuff. I managed to slip and pull my groin muscle a couple of times here which put me in a little bit of discomfort but nothing to prevent me from continuing. The ground conditions for the race were a mix of tarmac and mud making shoe choice difficult and there was no right answer really. We arrived at the Wraysbury stop (54m in 9.51) and I grabbed a coffee. It was probably at this point where I mentally decided that I didn’t really want to run anymore. Physically, I still had a bit of energy although I was a little stiff and sore from 50 miles of running but mentally I don’t think I really fancied it with the freezing weather and continued sleet and drizzle. Therefore, we settled into a “power walk” which meant the pace reduced to about 4mph. as we headed towards the next turn point at Walton on Thames. I remember walking over the bridge at Walton on Thames and expecting to see the checkpoint immediately but it was half a mile further which annoyed me for a bit as I was feeling cold as my body temperature was dropping due to the slowing pace and I really wanted a hot drink. We stomped on further as Wendy passed us coming the other way (some of the leaders had been passing us on their return leg before) and said a brief hello. Wendy was running in a top 10 position and was 2nd lady so despite being laid up with an illness the week or so before was putting in a great performance and her recent training efforts were really paying off. We got to the checkpoint at 65 miles in 12.19, stopped for a drink for a few mins before heading back. By now, I was not eating as much food as I didn’t really fancy anything at all and perhaps picked at some fruit or biscuits but not too much else. I had hardly touched the gels I had been carrying all day (I had consumed 1 much earlier but spat half of that out) and was trying to manage on real foods after my little sickness episode on the Winter 100. After this checkpoint we turned back towards Wraysbury and marched on at a good marching pace but very slow running pace and the occasional runner would drift past us. We started to cross a few people who were behind us and gave them a wave or a hello. By now it had been dark for a few hours and it was feeling cold, my feet were also feeling pretty sore especially when using the trail shoes on the pavement/road sections and I could feel a couple of blisters coming onto the soles of my feet. I was regretting the lack of a sock change now. I had my first little sleep wobble as I started to waver around a little and then took out my secret weapon (thanks to Matt Dunn) some jitterbeans which are basically coffee shot sweets. Combined with cutting out the caffeine in my diet for 3-4 days before I was hoping a strong caffeine hit would keep me awake and it really did. After a little while I felt quite awake and marched on although the cold weather probably helped aswell with a wind and sleet hitting you in the face. We trudged back to Wraysbury, stopped for a hot drink and some snacks and said hello to fellow Reading Jogger Adrian Lee who was crewing and then trudged back to the Windsor checkpoint (82m in 16.34) which despite all the walking and complete lack of running by now was still 2 hours up on last years time (which would have been around the Little Wittenham point). So 2.30am ish in the morning and 20 miles to go. I had estimated the last leg and back was actually closer to 22 miles and so with an average pace of 4 mph and a couple of checkpoint stops this was going to take at least 5 – 6 hours to complete which was a little frustrating when the first 22 miles took me 3.13. And so we trudged on. 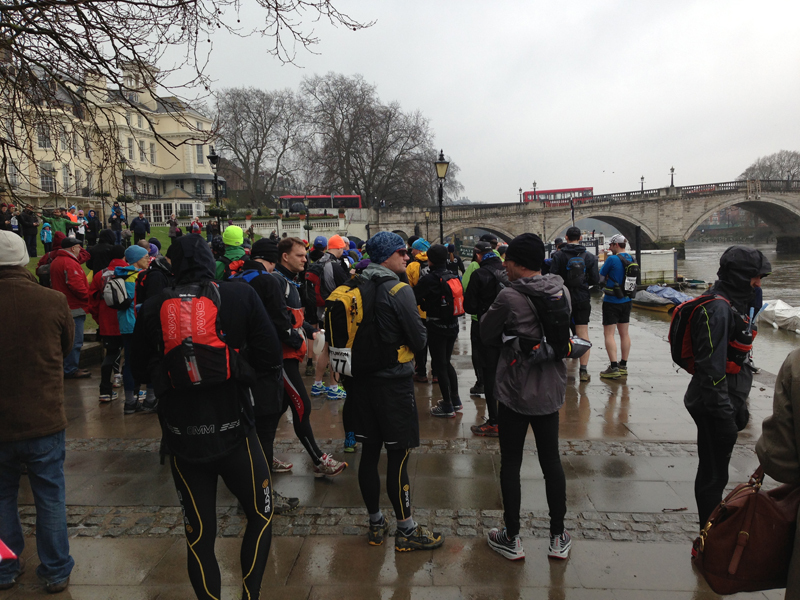 We were trying to guess when the first runners would pass us on their way back to the finish and it was when it as about half way between Windsor and Cookham when the leader passed us and then Luke Ashton (2nd) and Richard Ashton (3rd). We spoke with Richard briefly who said he wasn’t having a great time now but was in 3rd place on his first 100 miler (and only 3rd ultra) so was having a good run. Debbie Martin-Consani was 4th (1st lady) and the about another 15 or so runners passed us as we eventually got to Cookham. I had another sleepy wobble as my line of direction started to waver but took another couple of jitterbeans which sorted me out.. magic pills indeed! As we arrived I stopped for another coffee and ate a few rock cakes which went down quite well. Unfortunately, Peter Bowles ? (I think) was here and suffering from hypothermia as he was shivering uncontrollably as the aid station staff threw some blankets on him and tried to warm him up and position to portable heater on him. Unfortunately, he had decided to drop at this point only 11 miles from the end but it was some indication that you were never really safe from the cold, wet conditions at any point in the race. As we left to head back to Windsor for the final time it had started to get light but the temperature felt like it had dropped by a couple of degrees. I had a momentary incident when I thought I was going to throw up and started to retch but it was more due to discomfort as my buff was tight around my neck and Lindley adjusted it for me (which was probably just as much relief to him as it was to me). There’s not much to say about the last leg. It was now light and I was really glad to be heading back having not really enjoyed a pretty uncomfortable trudge for 50 miles or so. My feet were pretty sore now and I was looking forward to finishing, I didn’t care about the time at this point but just wanted to finish, get home, warm up and have something hot to eat. We passed runners (and walkers) coming towards us who still had 15-20 miles to go and were probably thinking how lucky I was only having a few miles to go! Eventually, I started to recognise the landmarks close to the aid station as we headed over the bridge through the town and towards the field, under the arched bridges and towards the boatyard. We had drifted past a runner who was hobbling but still moving which I later learnt was Wouter Hamelink and I recall seeing his name on the Viking Way Ultra starters list (147 tough miles) for the very next weekend, surely not? As we got close towards the end, I spotted two runners catching up with us and finally with 99.9% of the race completed I finally got a tiny bit competitive and thought I’m not going to lose a couple of places right at the death and picked up the pace right at the end, ran through the flooded section and finished in 23rd place (87 finishers from 165 starters) in 22.26 to a round of applause from the supporters and volunteers. James Elson passed on his congratulations and awarded me a medal, 100 mile in 24 hrs buckle and t-shirt and I had a lovely bacon sandwich and tea at the end. As runners were still heading through Windsor and finishing I didn’t want to hang around and hog a chair and we decided to head off quite quickly after thanking he volunteers. Particular thanks to Robbie Britton aswell for lugging my bag to the car as I hobbled around and collected my spare kit bag from Michael’s wife as Michael was due to arrive about 20 minutes later. I have mixed emotions about this race. The weather and ground conditions were pretty grim, cold and wet but probably not the worst I have faced (Caesars and probably the Winter 100 last year were both worse). The cold was a factor and did get to a lot of people as despite plenty of layers (base layer, running top, thermal layer and rain jacket from the start of the race to the end) you could still get cold if you weren’t moving. The race was 104 miles long which meant the extra 4 miles could have added 40mins if you were running (up to 60 mins walking) and so an hours improvement on last year was probably ok but after a good first 48 miles in 8.30, I did not have the inclination to run at all and that is not going to get me the results I am looking for at the GUCR or Spartathlon finish so the result is probably only a marginal step forward towards my 2013 goals. It wasn’t the result I was hoping for time wise but the result I deserved with the limited effort at night I gave it. A couple of observations and reminders for me when I re-read this report next year. The “jitterbeans” were amazing and caffeine reduction tactic seemed to work. For the first time ever at night, I wasn’t sleep-walking and clinging onto someone. Obviously, I should have gone easier at the start and may have been able to run for longer. I probably should have changed socks and looked after my feet at the half way point and I paid for this with worse than usual blisters on the soles of my feet. No right decision on shoes. Speedcross were ok in the mud but sore on the tarmac but a lighter trail shoe would have been worse in the mud (but don’t wear Lindleys Hoka’s as he was all over the place). Pack your kit properly as my back has been sore for 2-3 days where the head torch dug into it. Thanks to the Centurion team for putting on another event and having to deal with the late route change and weather conditions. The Centurion team have now attracted a loyal following of people ensuring these were well marshaled and supported by enthusiastic volunteers. Great job guys! Finally, big thanks to Lindley for giving me some company during the night leg, I really appreciate this. I will need to see how the groin injury settles down (I’ve managed a short 4 mile plod 3 days later) but hope to be at the Compton 40 in a couple of weeks.